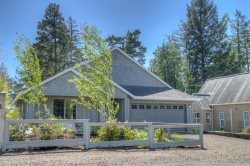 Experience this hidden gem in Manzanita, close to Nehalem Bay State Park with hot tub! View of the living room into dining area Sand Piper Surf Cozy living room with sectional sofa, Flat Screen TV, DVD player, and more ottoman full of movies, games, puzles and more. Wood stove with fire wood provided There is a desk in the living room for those who can`t get away from work Kitchen table will seat 6 View of open concept dining/kitchen with wine cubby Beautiful stocked kitchen with room to cook and prepare food Fully functioning kitchen with many amenities Master queen bedroom with full bathroom Another view of spacious bathroom Large walk in shower in master bathroom Queen bedroom with sheer and black out curtains. Has large closet and dresser. Full bathroom near the queen bedroom Full size fold-out couch area with half bath and TV Tv in fold-out couch area has Playstation 2, books, games. Half bath off of fold-out couch area. Washer and dryer located in hallway. The backyard is a great place to be. Soak in the hot tub or sit by the fire. Soak in the hot tub after a long day at the beach. Great space to gather with family or friends. The new backyard patio is a great place to BBQ, sit by the patio or play ping pong in the garage that opens to patio. Ping Pong Table in the garage with stereo, seating, etc. Opens to the firepit area. The house has 4 adult bikes and one youth bike for renter use. The front deck holds the table with umbrella. Seating for 6. Manzanita Beach is about a 7 minute walk. Just a few blocks. Sandpiper Surf is a newly remodeled, one level, two bedroom, two and a half bath home situated steps from Nehalem Bay State Park in Manzanita, Oregon. The beach is only a short six minute walk from the house and town is a twenty minute walk or a five minute bike ride. Bring the dog and enjoy all the scenery on your walk into town for shopping, coffee, and more. This home is perfect for one small family or two couples wanting to get away for a memorable beach retreat. Stepping through the front door you will feel right at home with the open floor plan, cozy wood stove and sectional sofa that converts to a queen size hide-a-bed. The recent update for this home includes new floors and furnishings that reflect modern beach decor. The dining table can seat eight with the leaf inserted and is open to the newly remodeled kitchen. The kitchen has beautiful quartz slab countertops, high end finishes and is well stocked for all the cook's needs. Nearby is the upgraded hall bathroom with tub/shower and large vanity. Just beyond the bathroom is the first queen bedroom which has a large closet and dresser. Beyond the kitchen area is a room with a full size fold out couch, TV, Playstation 2 and a half bath. This would be a great area for the kids. The final bedroom is the master and has a queen bed with a large, en-suite bathroom. The large walk in shower is amazing! The master bedroom faces the back of the house and has a sliding glass door that takes you onto a beautiful stamped concrete patio with hot tub, seating area and fire pit. Enjoy a soak in the hot tub and stories by the fire after a long day at the beach. And there's more! The garage doubles as a recreation room with a ping pong table, comfortable seating and bicycles for the whole family. Sandpiper Surf welcomes one small to medium dog. No cats please. This is a non-smoking home. Come stay and see why this new addition is going to be a fast favorite! Very close to state park entrance, bike trails across the street. 1 dog welcome. Must be at least two years of age and flea treated before arrival. No cats allowed. Everyone was a pleasure to work with. This home was exactly what we were looking for our family needs. Had everything we needed, and more!! Everything was perfect, exceeded our expectations. Only thing that could be improved is the smart TV... great location, walking distance to beach, state park, and manzanita shops and restaurants. Lovely interior decoration, very clean! Lovely working with all of you! Highly recommend the Sandpiper, the home literally has everything you need, right where you would look for it and generously well-stocked! Cozy and sparkling clean. Only issue was that the bicycles are in rather poor shape, some unusable. This didn't really affect us, but thought you should know. The communications we received were clear, friendly, and prompt. We had a lovely week at the beach. My favorite feature of this property is the attention to detail. There are beach toys and towels. To entertain the kids, there are games, movies, books, and the ping pong table. The kitchen has a wide variety of dishes and cooking supplies with plenty of dish towels, paper towels, and soap. Some other places we have stayed had limited supplies, but not this house. Whatever you needed was there, except for enough measuring spoons. I communicated with the team via email. They were very pleasant and helpful. I feel confident that should I have needed assistance, they would have been very quick to respond. We had a terrific time! The location to the beach was great and loved having all the ameneties. The fire pit, ping pong table, hot tub and bikes were a big hit! The only issue I had was the bed was not super comfortable for me, but otherwise loved our stay! The team was okay with which to work. We had to change our dates quite a while before our reservation and it seemed to take a bit of explaining to manage. There was also a fee to change our dates which seemed excessive so far out. We thoroughly enjoyed our stay. The property fit our needs perfectly. There was plenty of room for everyone. The back yard fire pit, hot tub, and garage ping pong table were perfect places to spend the evenings. The kitchen is extremely well-stocked. We felt the owners had thought of everything. Very peaceful (there didn't seem to be any neighbours), lovely decor and furnishings-- perfect beachhouse feel, great selection of books! The house was so well supplied and in a great location to access the beach and shops. Prior to our stay I had one email question which was responded to quickly. The house is beautifully decorated with modern upgrades. We appreciated coming into a lovely and clean home. Since it rained about half the time we were there (and we couldn't go to the beach), the house was a great place to hang out and enjoy being together. The excellent TV service and Wifi were appreciated.